Editor’s Note: FightingArts.com is pleased to be able to offer this first in a series of articles on ground technique by Eric Joseph. Although somewhat diminutive in size, Joseph is one of the most daunting grapplers I have known, a person who combines tactical knowledge, superb technique and lightening fast speed. Thanks also go out to Mike Hawley, another fine judo-ka and superb aikido-ka, who assisted. If you are not versed in ground fighting, you can easily find yourself at a disadvantage, even endangered, against a skilled opponent if you should go to the ground. Learning some basic ground techniques will round out your skills and make you better prepared. 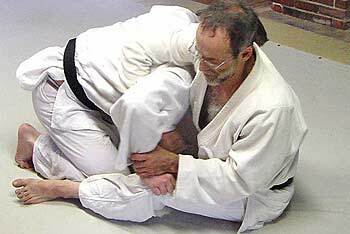 This armlock is one practice by practitioners of Judo, jujutsu, and many who wrestle. Learning how to execute it is important, not only as a tool you might use if taken to the ground during a confrontation, but also to teach you what to look for so you won’t find yourself in the unfortunate situation of having someone execute it on you. This technique in judo is classified as a kensetsu waza (against the joint technique) and is known as ude-garami. In the photos below the opponent enters between the defender’s legs, but the technique can also be executed from a variety of positions, such as when the defender is on the bottom, or on top, anywhere the two combatants end up on the ground face to face, or across each other, grappling. Your opponent is coming at you between your legs. Pull your opponent close. With your right arm reach over your opponent’s left arm and grab your own wrist. Force your opponent’s arm backward so it is bent at right angles. 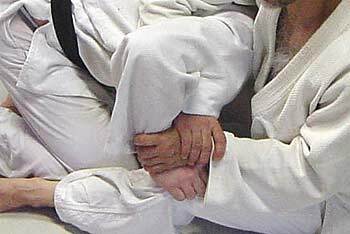 A close up of the armlock grip. 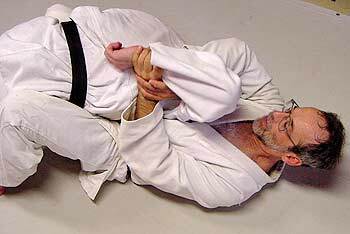 Squeeze your knees to control your opponent’s body as you lie back (careful to maintain the 90 degree angle of your opponent’s arm). Lift your opponent’s wrist to execute the lock. This can be very painful and dangerous, so be very careful not to injure your partner. The best defense against this bent arm lock is to grab your own belt or uniform (or clothes) before the lock is in place so your wrist and arm can not be leveraged backward. 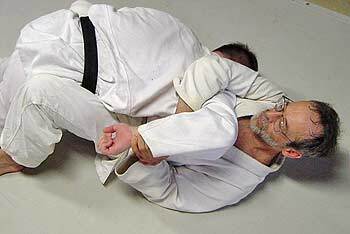 A natural reaction (a defense seen in some judo books) is to try to thwart the lock (before it is completed) by grabbling your own right wrist with you left hand and pushing your arm outward (straight). I would not recommend this defensive, however. 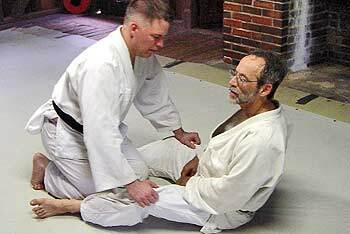 By straightening your arm you become vulnerable to a straight arm lock (if your opponent was knowledgeable enough to try the first bent elbow armlock he will probably also know the straight arm lock). Law Enforcement Note: While this is not recommended as a handcuffing technique, if you are in law enforcement and you find yourself in this unfortunate situation (grappling on the ground), notice that the attacker’s arm and wrist is controlled and positioned to the rear where it can be handcuffed by another assisting person. The person is also stabilized and controlled by pain so the other arm can be easily added.